I’ve (almost) got a quilt top. I’ve participated in only one quilt bee and it was a great experience. It was a virtual bee, which is to say an ‘online’ bee vs a group of women getting together to sew. I joined a group on flickr, which is where we interacted – posting block instructions to discussion threads, sharing photos and just regular chit chat. Our bee was 6 months long, and we sewed a block for 2 members each month. April was my month, and in late March, I sent out fabric and instructions to each of the members. Using Terrain by Kate Spain, coordinating Kona solids and Kona White, they stitched up an Antique Tile block for me. 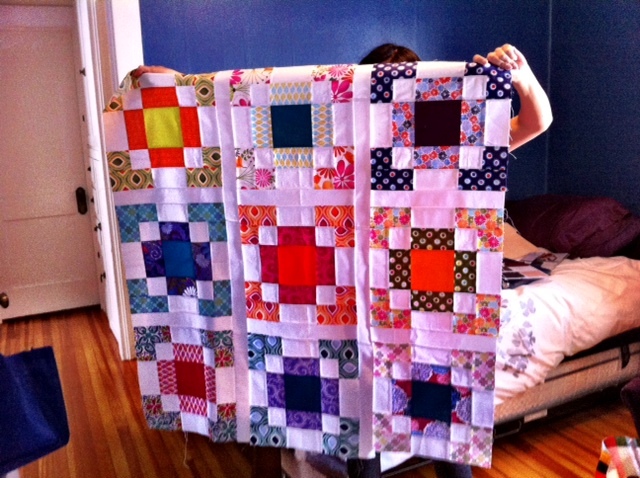 There is 1″ white sashing between the blocks and I’ll add a 3″ border to finish up the quilt top. Shortly, I’ll have a nice lap quilt. Looks great! I have yet to participate in a bee. Maybe I should one of these days! You should! I had fun seeing the blocks come together for the bee members. I’m with julie, I’ve never done a bee either. Looks great!! They are so fun. Thanks for stopping by! What a good advertisement for quilting bees. The blocks are gorgeous and it will make a beautiful quilt when all is done.